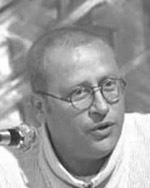 Born in a small town near Ramallah in 1954, Barghouti obtained a PhD in comparative literature from the University of Washington in Seattle, Washington. Back in Palestine in the mid- 90’s, he becomes a professor at the university of Birzeit, and creates in 1998, in Ramallah, “The house of poetry”. Barghouti’s writing is very diverse. He wrote critical essays, novels, poetry collections; he achieved a beautiful Arabic translation of “Romeo and Juliette”; he wrote and directed a play, and just before the present work, published post-mortem, he wrote “The blue light” that tells the story of his student years in the USA. “The blue light” was published by Sindbad, France. The author passed away in 2002.